On your college dorm checklist for your dorm room shopping you probably have your dorm bedding and dorm rug to keep you comfy and make your dorm room feel like a home away from home. You probably haven't thought about adding foot coverings to your dorm essentials list. Sure you can use socks, but they're not as warm or comfy and for that matter, slippers aren't very warm either. To really make your dorm room feel like a home away from home, add our Dorm Snoozies! How can these college foot coverings make your dorm room feel like a home? When you wake up in the morning and step on the cold, hard dorm linoleum that starts when your dorm rug ends, you will be jolted awake and reminded that you aren't home because your room at home probably does not have cold linoleum. With a pair of Dorm Snoozies by your dorm rug, you can step into these warm, comfy foot coverings instead of a cold, hard dorm room floor! Our Dorm Snoozies are also great when you need to do laundry in the dorm room basement. You definitely don't want to walk down there barefoot and you probably don't want to put the effort into putting on shoes and socks. 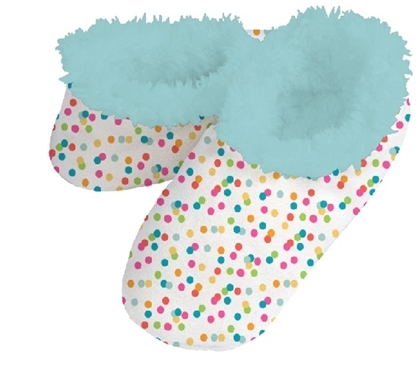 Our Dorm Snoozies slip on easily and also have a non-skid sole so you don't slip and slide while taking your laundry to the dorm laundry room. Made of brushed fleece on the outside with a super soft Sherpa interior, your feet will never be cold or uncomfortable in our Dorm Snoozies with a fun confetti dot design! In fact, you won't want to take them off!